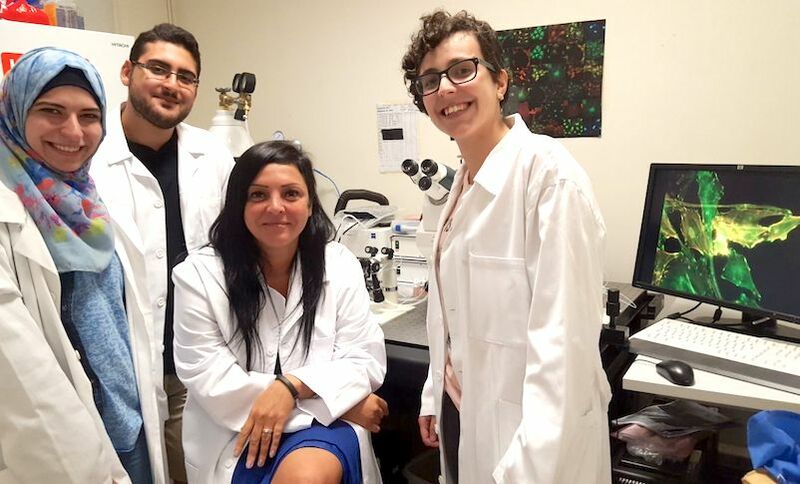 LAU associate professor of Cell and Molecular Biology has been recognized by the Abdul Hameed Shoman Foundation for her distinguished body of research in cancer metastasis. “I believe we need to reinforce a culture of research in Lebanon, and I’ve been nurturing it at LAU for many years,” says Associate Professor of Cell and Molecular Biology Mirvat El-Sibai, who this month was named as a recipient of the Abdul Hameed Shoman Award for Arab Researchers. El-Sibai was recognized by the Shoman Foundation for her extensive and impactful body of research, but the scientist is clearly as dedicated to the work and achievements of her students as she is to her own. “Our duty as scientists is to teach research,” says El-Sibai who, since joining the university in 2009, has taught and mentored hundreds of students. Dozens have graduated with an M.S. in Biology from LAU and many went on to enroll in the Ph.D. program at The Einstein School of Medicine, El-Sibai’s alma mater. The cancer research work that El-Sibai established at LAU has helped attract several Ph.D. candidates, in addition to post-doctoral fellows and volunteers. Notably, the scientist developed a high-tech cell biology laboratory by introducing new techniques such as state-of-the-art live microscopy methods and single-cell assays to detect protein activation. “Ensuring we keep up with the latest technological advances has enabled us to be the first to make a number of discoveries,” enthuses El-Sibai. Many of those discoveries go against established dogma. One series of studies she conducted with her students revealed that proteins that act as tumor suppressors could also be oncogenes — genes that can potentially induce cancer. Another identified a specific protein, RhoA, long considered an inhibitor of cancer metastasis, as one that in fact promoted it.